Materials: papier-mache, foaming polyethylene, foam plastic, foam rubber, metal wire, fabric. The puppet has the first originally constructed body made of foaming polyethylene. - string marionette, character of Russian folk songs performer. 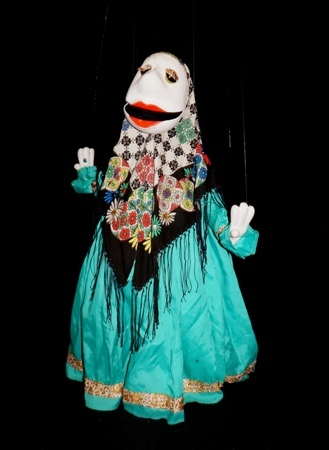 Prototype of the puppet is a famous Russian folk singer Lidiya Ruslanova. See PHOTO ALBUM of RUSSIAN SONG. Russian singer in film "Nikolai Zykov Theatre of marionettes", Moscow, Russia, 1993.